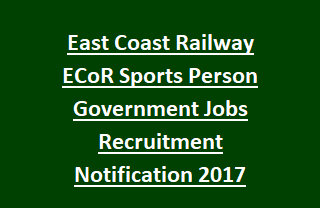 ECoR Sports Person Jobs Recruitment Notification 2017: East Coast Railway, Odisha welcomes application forms through offline mode from eligible Indian Citizens for the recruitment of Sports Person Jobs. There are total 21 vacancies available in this East Coast Railway Recruitment 2017. Interested candidates have to send application through offline before 18th December-2017. Application forms available at ECoR official website @ http://www.eastcoastrail.indianrailways.gov.in. Filled application form with relevant documents must be reach to the office before last date. For remote areas application submission last date is 02-01-2018. Eligible candidates will be selected based on their marks obtained in written test/ Physical Tests/ Interview. Pay Scale for this ECoR Sports Person Jobs is Rs. 5200/- to Rs. 20,000/- plus Grade Pay. Application fee for UR/ OBC candidates is Rs. 500/- and for others is Rs. 250/-. Age of the candidate applying for this East Coast Railway Recruitment vacancies is 18 years to 25 years as on 01-01-2018. For more information regarding Selection Process, Educational Qualifications, Application Procedure, Application Fee, Age limits of East Coast Railway, Odisha Recruitment 21 Sports Person Jobs are mentioned below.